SilkDamask : My kilt arrived...but I think I left my sporran at the Athenaeum. My kilt arrived...but I think I left my sporran at the Athenaeum. As the cold air of the North Atlantic finally broke through the hot July air mass sitting over coastal New Hampshire my new kilt arrived from the North Carolina kilt-maker, Matthew Newsome, www.NewHouseHighland.com. In a trade route nearly 400 years old, funds went to Scotland for cloth (D.C. Dalgliesh of Selkirk, www.dcdalgliesh.co.uk), which was then shipped to the Carolinas for tailoring and then finally a completed garment was sent to New England. A double dose of history, kilt and trade, delivered on a summer’s day. After many years of thinking about getting a kilt the day of reckoning had arrived. I opened the package and pulled out the kilt. I am going to wax lyrical about this for a short while because it’s just one of those moments in life when touch, smell and fit lift you from the everyday world. The cloth is exceptional with a weight and drape that met every expectation, and reminded me of why I prefer pure wool to blends. The hem is a selvage and the sunlight caught the nuanced reflection, visible to the owner, but not the world, a subtle reminder of tailoring to the cloth. Trying on the kilt for the first time was a moment of sartorial bliss. It looks grrreat, sits rrright, as it should be -- but isn’t always. For the first time since receiving it as a generous birthday present from my wife, I was able to use the sporran from McRostie’s, http://www.mcrostie.co.uk/ (We both rode horses for years and for a moment, the smell of this sporran made from bridle leather combined with the wool kilt reminded me of crisp autumn canters and cold winter gallops, a memory, not bad poetry.) 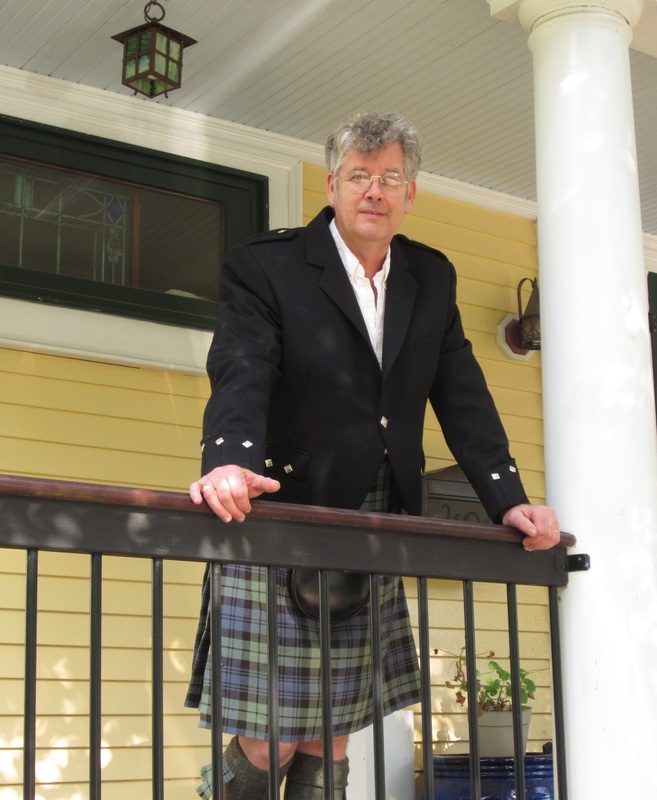 I wore my new kilt to the Athenaeum (Portsmouth, NH. USA) to show a friend and enjoyed a day of unexpected encounters. While descending the parking garage staircase, a woman saw me and reminisced about how years earlier she and a girl friend saw a very handsome man in a kilt at a gathering of the clans who turned out to be a minister, which in their youthful innocence surprised them. Later I stepped into a local Celtic shop to ask if they had a kilt hanger and I got into a conversation with a local police officer, who spoke from experience, about the merits of a good hanger for such an important purchase and the need to keep the pleats in good shape; just two of several conversations that I had during my travels today sparked by the kilt. To end it all, today was a very humid day and I needed to consult with a colleague on a project, so I used the Athenaeum lavatory to change from the kilt and jacket into summer clothing We had our meeting, parted and I stopped at the house to drop the kilt kit. When I opened the garment bag on the bed to lay everything out, then put it all away, there was no sporran. While having one of those a mind-panic conversations that you have with yourself, as you attempt to justify to the nonexistent passenger in the car why there is no longer a sporran in the house, I slowly drove through the summer-time crowds who were crossing every street in town with willful abandon. The city parking garage placed the “garage is full” sign in the entrance just as I was ready to use it. Then as I turned down the one-way street that I knew would hold the one parking space unknown to most people, a car was coming toward me in the wrong direction. I stopped and shook my head no, as I could not back into the tourist thronged sidewalks without hitting someone and in the summer, the town awards no points for hitting potential money spenders. The other car maneuvered off the street and I saw, then took the parking spot. Once in the Athenaeum I ran to the third floor to check the tables where we had been working, nothing was there, and then I remembered the lavatory, and at that moment so did 4 other people. As I stood talking to another member regretting not skipping the line, a man came out of the lavatory and asked the woman ahead of him if she had left her pocketbook, which in all fairness to him with it’s thin leather strap, the sporran could be mistaken for a small shoulder bag--but it’s not. I have never had so much traction from a suit of clothing. I kind of like this. July 18. Matthew Newsome, the kiltmaker, just sent along some photos he took of the kilt with the pleats finished and the basting stiches applied. Jeff Hopper is an author, editor and men's wear blogger for SilkDamask. You may catch a glimpse of him in his new "every day wear" walking in downtown Portsmouth! His earlier post "A Kilt: The Tale of a Plunge" appeared on this blog on December 5, 2012.